Do you also notice how farm staycations are becoming more popular nowadays? It seems that, as we seek our way back to nature, we get more drawn to farms and rest houses in natural settings. Costales Nature Farms offers a quiet retreat and farm tours to their guests. It’s the premier agri-tourism destination in the country. 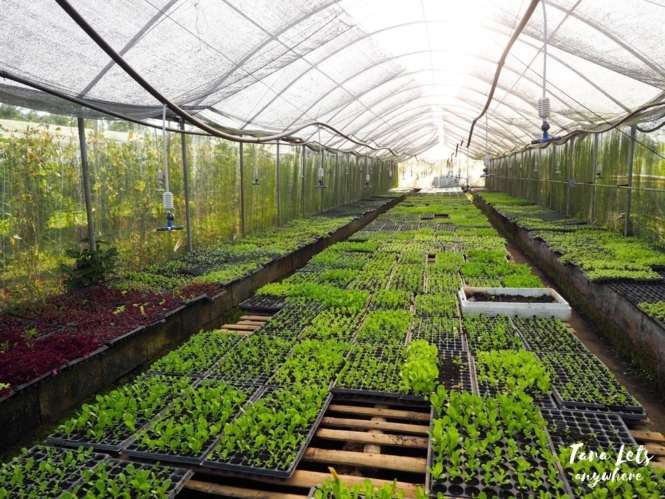 Costales Nature Farms produces organic vegetables and herbs and also processes organic meat. They supply major corporations such as Shopwise, Healthy Options and Itallianni’s. They also offer internships, workshops and tutorials to those who want to learn more about organic farming. Lastly, they are open for investments particularly from OFWs. Jona (of Jona Shares) and I spent an overnight stay here in Costales Nature Farms, and we loved it! Let me show you why. Whether you’re a nature lover like us, a couple who wants to do activities together, a family who wants somewhere to bond and have fun or a student who wants to have hands-on learning about organic farming, Costales Nature Farms is ideal for you! 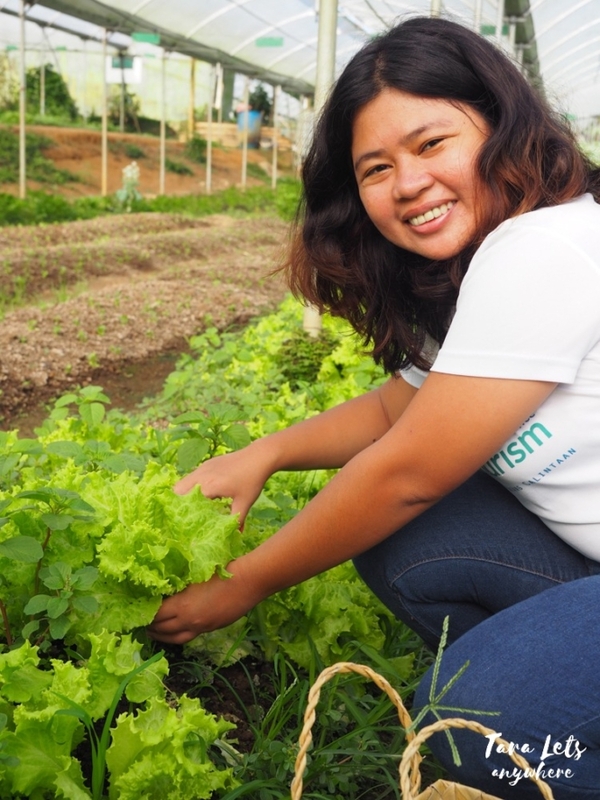 Our guide Ate Neri showed us around the farm and explained the technologies that they use in Costales Nature Farms. 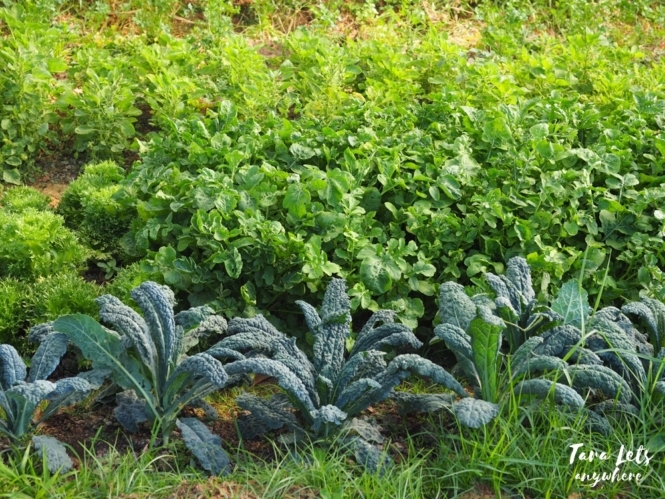 Most notable is the use of EMs or effective micro-organisms which makes the soil rich and counter bad bacteria. 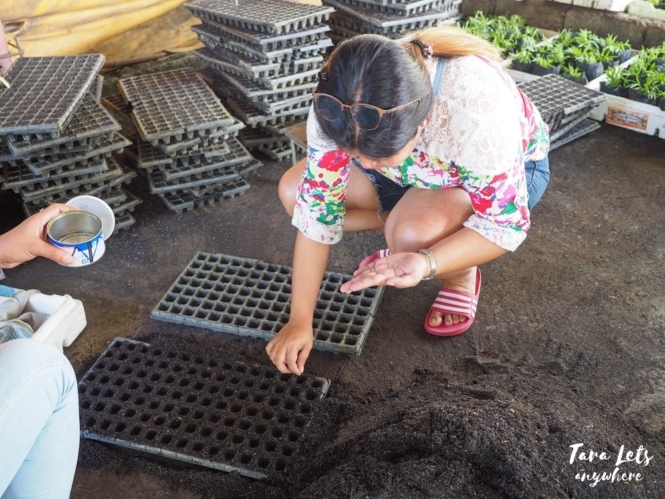 The tour started with Ate Neri showing us how they plant seedlings in containers and pointed us some of the things they use for urban gardening, such as Grow Bags. I love this part since I’m interested in UCG (urban container gardening), which is advisable for households to grow their own produce. More urban container gardening design. We were also shown the nursery and vermisery (basically types of greenhouses) and their fertilizer area. Of course, we also got to see some of the animals they keep in the farm. 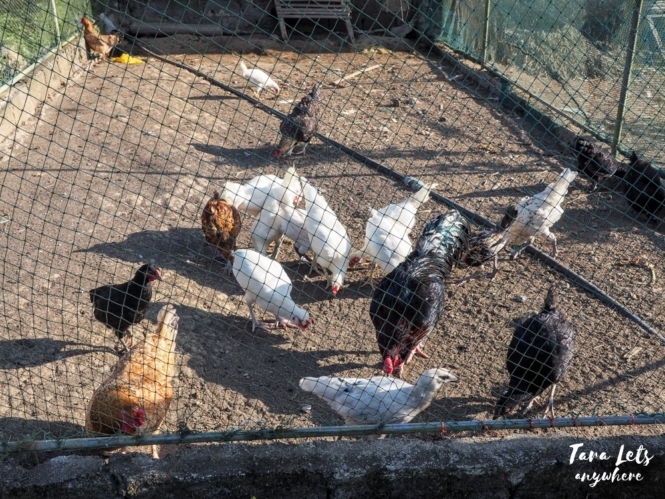 There are various types of free-range and organic chickens in Costales Nature Farms, and it so happened that during the time of our tour, it was their breeding schedule. Some of the chickens we saw were sitting and in the process of laying eggs. 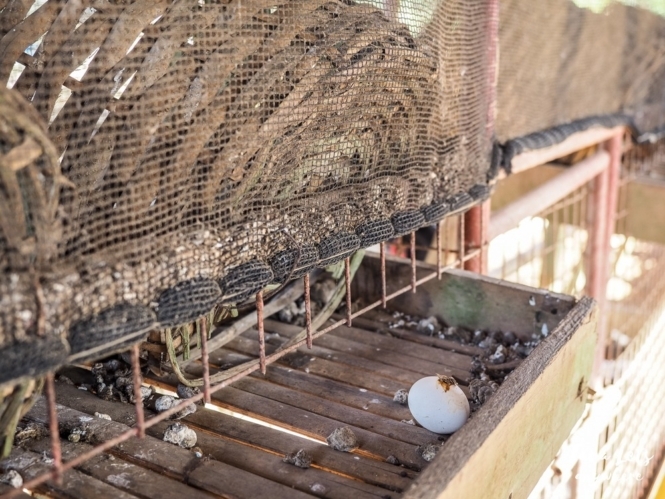 We even got to collect one or two eggs laying in one of the coops. Fresh egg from the coop. 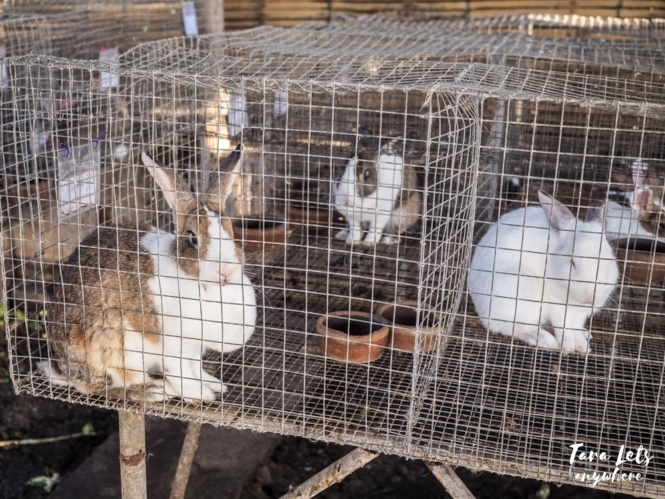 We also saw where the rabbits are kept. It’s interesting to note that despite the number of rabbits in this cottage, the cottage doesn’t have a piss smell. Ate Neri says it’s due to their diet and the EMs sprayed in the soil. 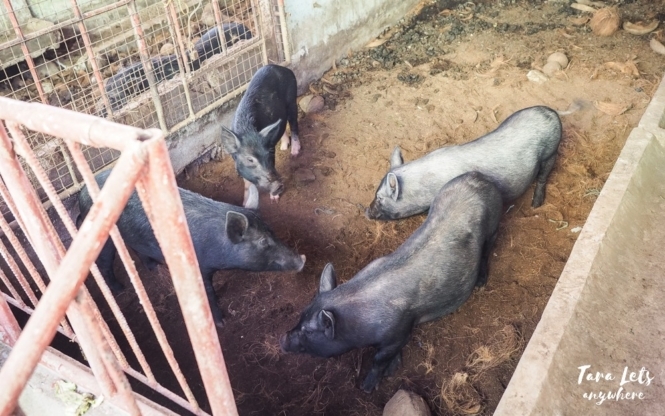 Lastly, here are some pigs that they keep. Mass production of livestock is done in a separate farm (Farm A is the one open for guests, Farm B houses mass production and only accessible to workers). As we go along the tour, Ate Neri also pointed out a number of trees (e.g., curry), herbs (e.g., tarragon, spearmint) and forage crops (power plants for animals) that they grow. Costales Nature Farm practices zero-waste management, so everything that grows in this farm is used in some way. Here’s another favorite part of our stay in Costales Nature Farms. 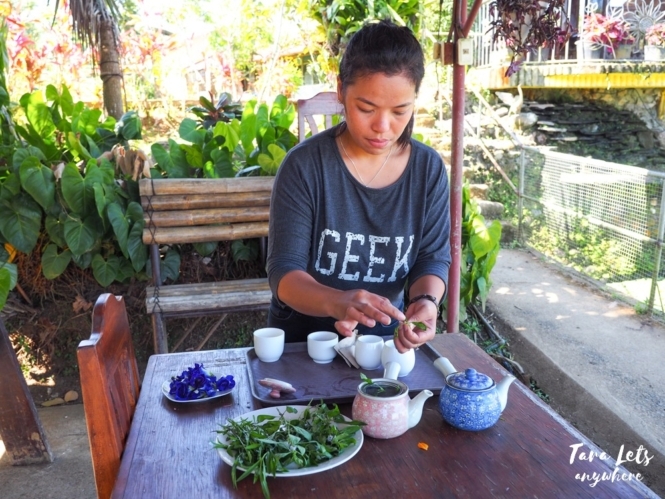 Basically, we tried the ff: fishing, salad making and tea making. Fishing is advisable on mornings. We only caught small tilapias which we threw back in the ponds. Apparently, the older (and bigger) fishes tend to stay at the bottom to eat planktons, so it’s only the small ones who get baited. 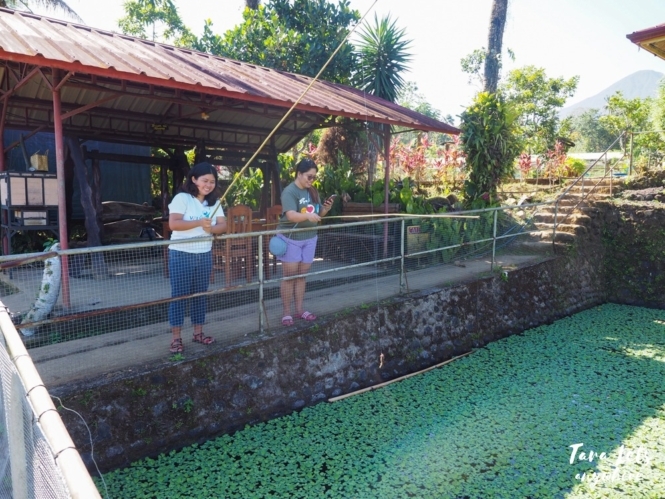 At the end, we simply threw pieces of lettuce in the pond and watched the fishes finish them off. Fishing in the pond. Caught a small fish! For the salad making, we get to pick the ingredients. 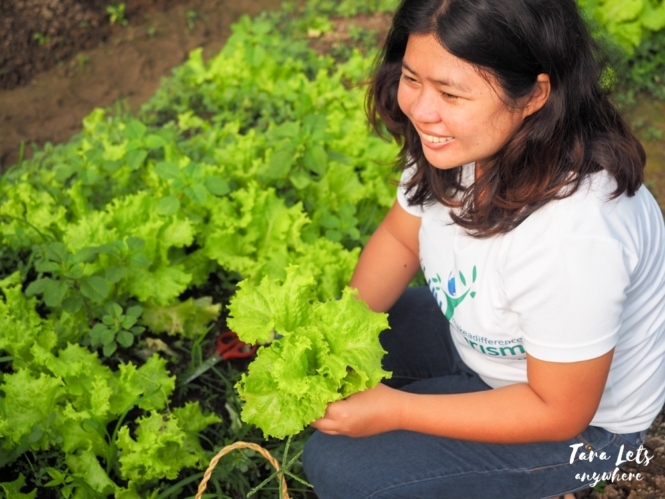 Ate Neri showed us how to cut off the lettuce from the ground. We got iced lettuce, romaine lettuce and frillice lettuce. Lettuce picking is honestly so fun. 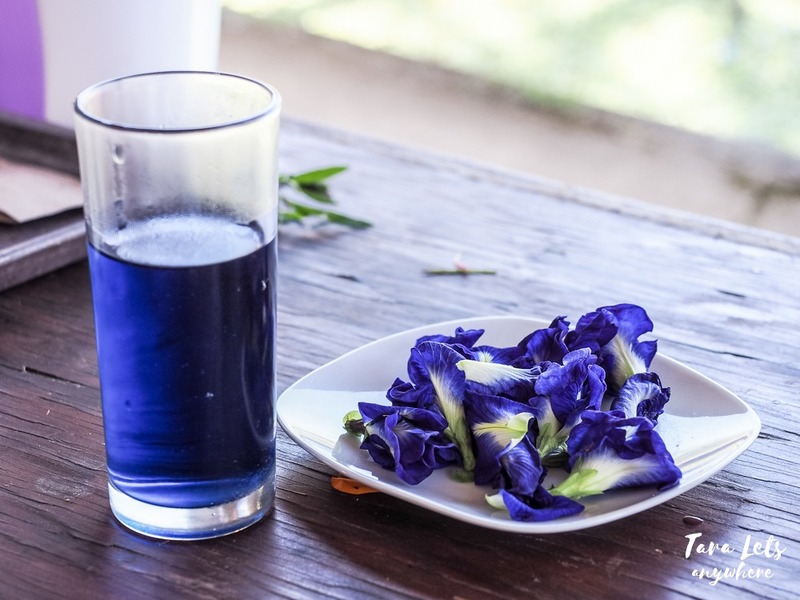 We also picked flowers — blue ternate, cosmos and kamantigue. Lettuce picking. One of our favorite activities in the farm. We found an empty cottage in the farm and made our salads. Here’s mine! Here’s the salad I made! Afterwards, we proceeded to making tea using (1) tarragon and spearmint and (2) blue ternate and tarragon. The first tea tasted like menthol candies, and Ate Neri said spearmint is indeed the one used in candies and toothpastes. 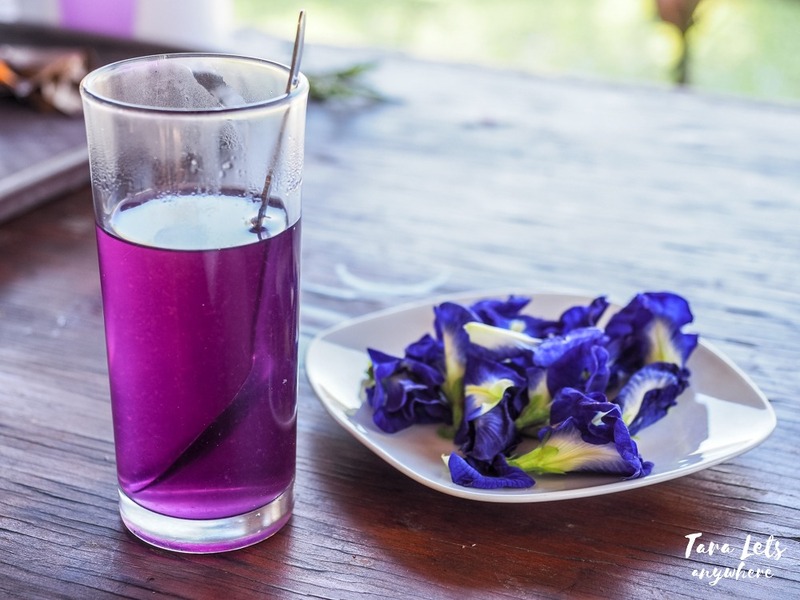 The second is interesting to make because the blue ternate creates a blue-colored drink that then turns to purple as we add calamansi juice. Honey is added to our tea as sweetener. 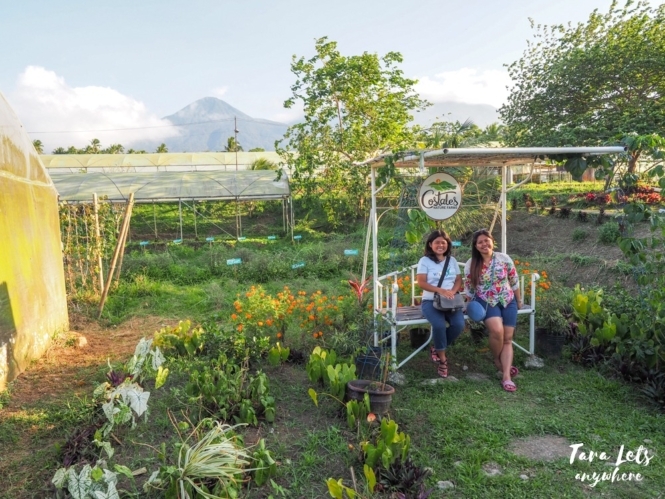 Farms, animals and a backdrop of Mount Banahaw is indeed a wonder to the eyes. With Mount Banahaw on the background. 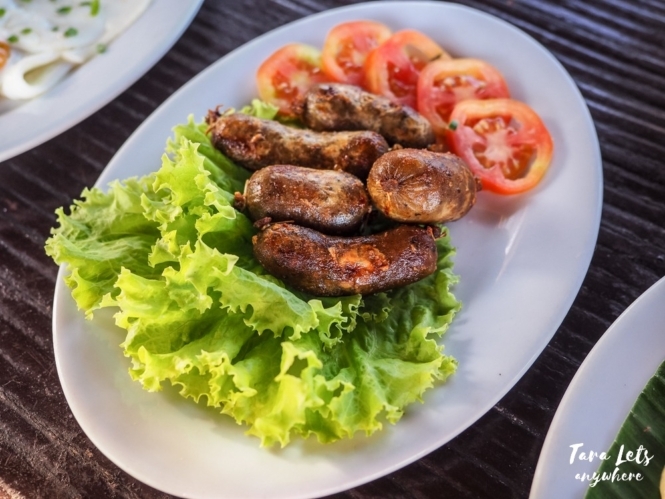 Costales Nature Farm offers a farm-to-plate dining experience so you’re guaranteed that the ingredients used in the meals are fresh and healthy! Not to mention delicious as well. I particularly like their salad with their own version of vinaigrette (also sold in their stores at P200 per bottle). I also recommend the ff: mushroom soup (the tastiest mushroom soup I’ve had), crispy pork liempo, ginataang kale (kale in coconut milk) and their famous pork-ganic longganisa. For the drinks, try any of their tea and their sweet cucumber juice. 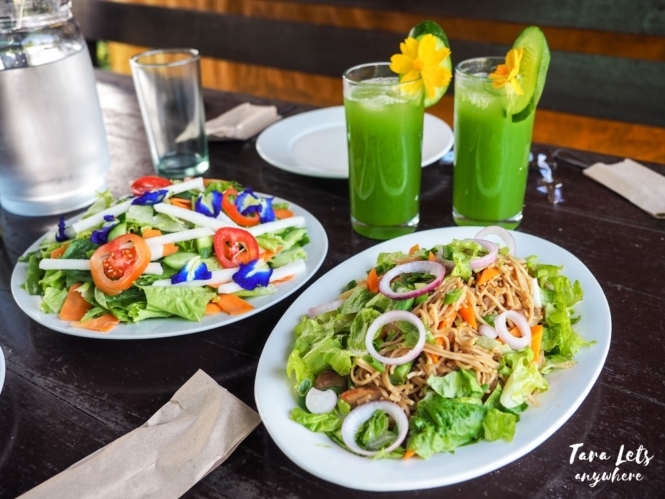 Welcome snacks – pancit habhab, salad, cucumber juice. Here’s our dinner. Mushroom soup, crispy pork liempo, ginataang kale and grilled tilapia. Honestly, we love all the food served in Costales Nature Farms and I’m amazed at the variety of dishes they prepare from harvesting produce in their backyard. Costales Nature Farms offers day tours as well as overnight stays. We stayed in a kubo good for 2 people and enjoyed a relaxing overnight sleep in the farm. Don’t go without bringing home something. 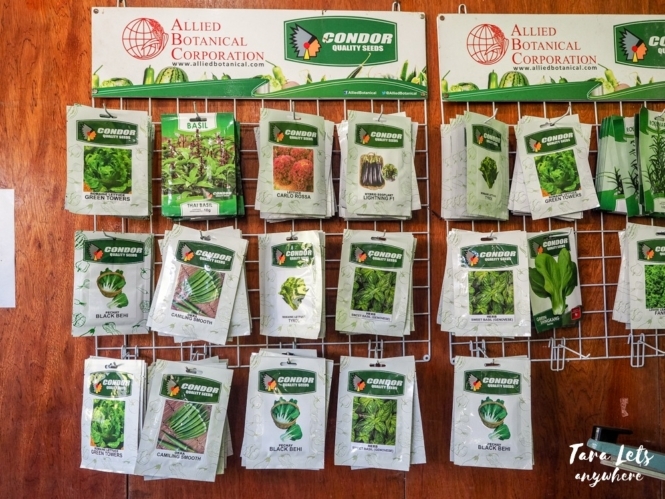 Costales Nature Farms has a store where you can buy seedlings and organic products such as juices & wines and household items. Pots of plants and herbs are also available for only P50 each. Public vehicles headed to Lucban also pass by Costales Nature Farms. Just tell the driver to drop you off here. From EDSA (Option 1): ride a bus en route to Calamba. Get off at SM Calamba and then ride a van going to Lucban. From EDSA (Option 2): ride a bus en route to Sta. Cruz, Laguna. At the Sta. Cruz Market, ride a jeep to Majayjay. From Majayjay town proper, take a jeep to Lucban. 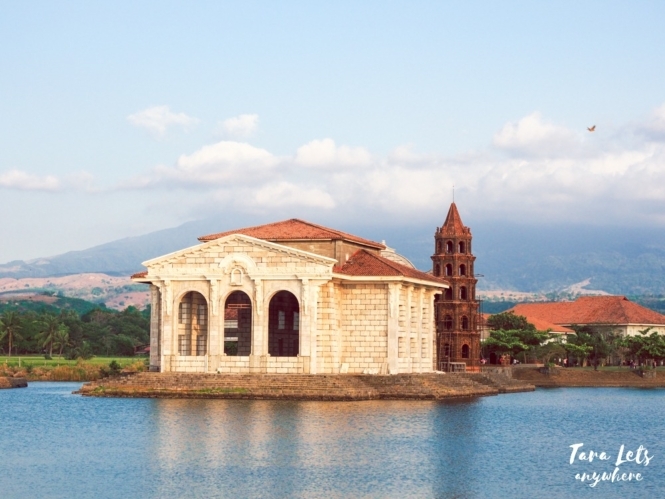 From Alabang: head to the terminal in Festival Mall and ride a van bound to Lucban (2.5 hours, P180). Get off at Costales Nature Farms. If you’re going from Festival Mall in Alabang, make sure to allot time for waiting. In my case, it was almost an hour before the van got full. There are overnight packages and day tours available at Costales Nature Farms. 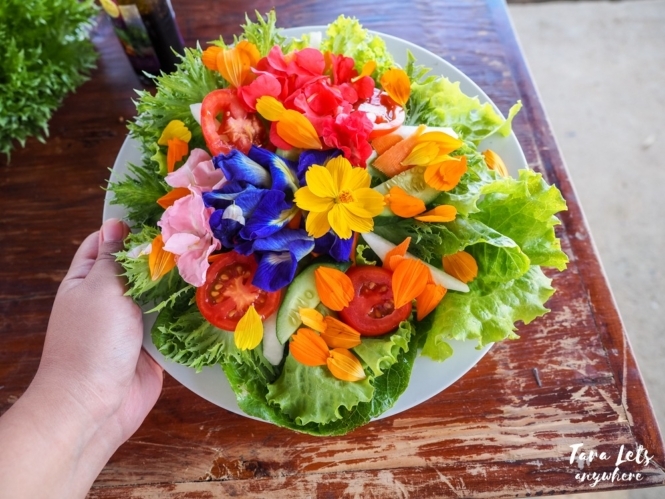 For a day trip, you can avail of the Green Salad Tour for P495, which includes half-day access to Costales Nature Farms, guided farm tour and activities, as well as snacks. Alternatively, some people simply order food in the restaurant and automatically have access inside the farm where they can explore by themselves. Check all the available tours here. For overnight stay, you can choose among nipa huts and villas. Breakfast and guided farm tour is included in their rates. Welcome to Costales Nature Farms! 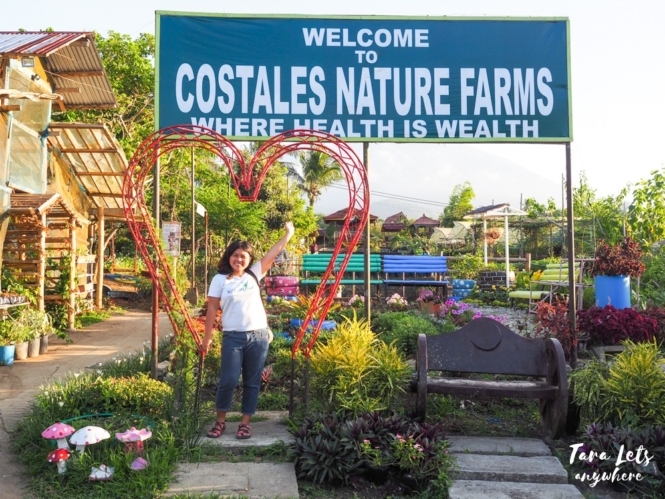 Disclaimer: Thanks Costales Nature Farms for hosting our stay! As always, thoughts and opinions are my own. Have you been to a farm tour or farm staycation? Let us know in the comments below!